The Kenya Tourism Board had cause for celebration earlier after Kenya scooped nine awards at the annual World Travel Awards Africa & Indian Ocean Gala Ceremony. 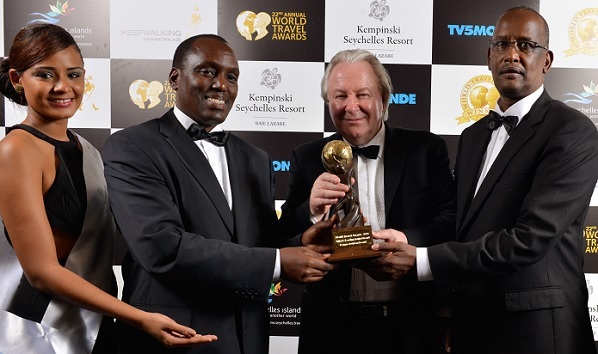 At the event, hosted by Kempinski Seychelles Resort, the organisation retained the trophy for Africa’s Leading Tourist Board, which KTB has held for four consecutive years. The Maasai Mara National Reserve was also recognised in the category for Africa’s Leading National Park. In a further boost for the coast, following the removal of the FCO travel advisory from the Mombasa region north to Watamu for UK visitors last Thursday, Diani Beach clinched the award for Africa’s Leading Beach Destination for the second consecutive year. The event also proved to be a rewarding evening for the private sector in Kenya, with Twiga Tours, Carlson Wagonlit and Naivaisha-based spa resort Enashipai among the winners. KTB managing director Muriithi Ndegwa welcomed the award for the best tourism board and attributed the success to the dedicated staff and support from the parent ministry as well as the private sector. He said: “We are honoured to win the title of the Leading Tourism Board for the fourth time running. He said the voting of the Maasai Mara Game Reserve as Africa’s Leading National Park and Diani as Africa’s Leading Beach Destination was an indication of Kenya’s unbeatable position as a leading safari and beach destination. “We are leveraging on these endorsements of our traditional products to promote our other diverse tourism products across the destination,” said Ndegwa. The 2015 winners of Africa & Indian Ocean World Travel Awards will be announced at the annual Africa & Indian Ocean Ceremony to be held this year at Kempinski Seychelles Resort, Baie Lazare, 20 June.